I visited Getaway, at Southampton, in January 2014 and stayed on-board for two nights. This brand new ship had come straight from the shipyard, via Rotterdam. She was berthed at Southampton’s ‘City Cruise Terminal’ before she crossed the pond to her home port of Miami. Getaway is the sister of Breakaway, which was the first off the the ‘Breakaway’ and entered service in April 2013. It is impossible to fully experience all of the dining options, bars and entertainment options of this big ship, within a few days. Therefore my review concentrates on the design of the ship itself. It’s just not possible to properly review ‘Getaway’, without looking at what came before her in the NCL fleet. (However If you are in a hurry, skip straight to the ‘Getaway’ sub-title). 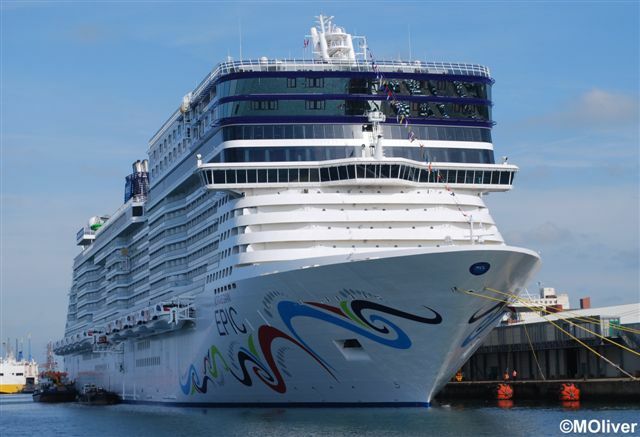 Before June 2010 the ‘Norwegian Cruise line’ (NCL) had a fleet of ten ships in the 75,338 – 93,558 gross tonne range, generally carrying around 2,400 passengers each. NCL are famous for their ‘freestyle’ innovation which all of their fleet are now specifically designed for. In short there are multiple restaurants and no allocated dining times, so passengers are free to dine when they like, where they like and sit with whom they like (between core hours). The pre-2010 fleet have up to twelve dining options with some of these carrying a surcharge, others not. The dress code is casual. Top Heavy: Epic at Southampton, June 2010. NCL entered the mega-ship league with ‘Norwegian Epic’ in June 2010. According to NCL, ‘Epic’ was the most ‘innovative’ ship afloat, costing $1.1 billion. In 2014, Epic is still NCL’s biggest ship and second biggest ship in the world, although quite along way behind Royal Caribbean’s ‘Oasis’ and ‘Allure’ ships, in size. Epic has many multiple dining options and multiple entertainment venues. Epic was originally meant to be one of two 155,873 gross tonne, 4,200 passenger ships, code-named F3’s (an abbreviation for ‘third generation freestyle’). However the second F3 was cancelled due to financial issues and disagreements with the STX shipyard, Chantiers de l’Atlantique, France. At times NCL are so brave that they balance on the knife-edge between innovation and risk. Epic’s external appearance is certainly unique, with her top-heavy (ugly) forward superstructure, housing the private ‘Villa Suits’ (re-branded ‘The Haven’). Her ‘New Wave’ cabins, with curved walls are very stylish indeed. However the attractive décor could not disguise that fact that these cabins were narrower than most on many other modern ships. They also have a very controversial split toilet and shower layout, on opposite sides of the cabin door, with semi-transparent glass doors. This cabin design was panned by many critics and freaked-out modest passengers who expected more privacy for their money. NCL are now on the record as saying that Epic was also a little too big*. NCL underwent a change of CEO and not surprisingly returned to their favourite shipyard Meyer Werft, in Germany, for project Breakaway. (Meyer Werft had constructed most of NCL’s pre-Epic fleet). Two ships were initially ordered: Norwegian Breakaway (April 2013) which will be based in New York and has NY themed décor, and Norwegian Getaway (January 2014), which will be based at Miami, with Miami themed décor. Each are 144,017 gross ton vessels, so are a little smaller than Epic, carrying 4,000 passengers (lower berths). Although the ‘Project Breakaway’ ships are a completely new design, internally they replicates many of the ideas pioneered on-board Epic. However there are some major differences: 1) Breakaway is 12,000 gt smaller than Epic and will generally carry a few hundred passengers less. 2) The much criticized ‘New Wave’ cabins have been replaced with conventional designs. 3) Externally the ship is much more attractive than Epic with ‘The Haven’ complex being better integrated into the superstructure. 4) Breakaway has ‘The waterfront’ feature (more about this later). 5) Breakaway has Azipod propulsion for improved manoeuvrability. Two bigger versions of the ‘Breakaway class’ design, called ‘Breakaway Plus class’, will be delivered in 2015 and 2017. Escape and Bliss will be around 163,000 gt and both have an extra deck. They will be the third biggest cruise ships class in the world, behind Royal Caribbean’s ‘Oasis’ and ‘Quantum’ class ships . *Oddly they will be bigger than Epic, which they have previously said was too big. 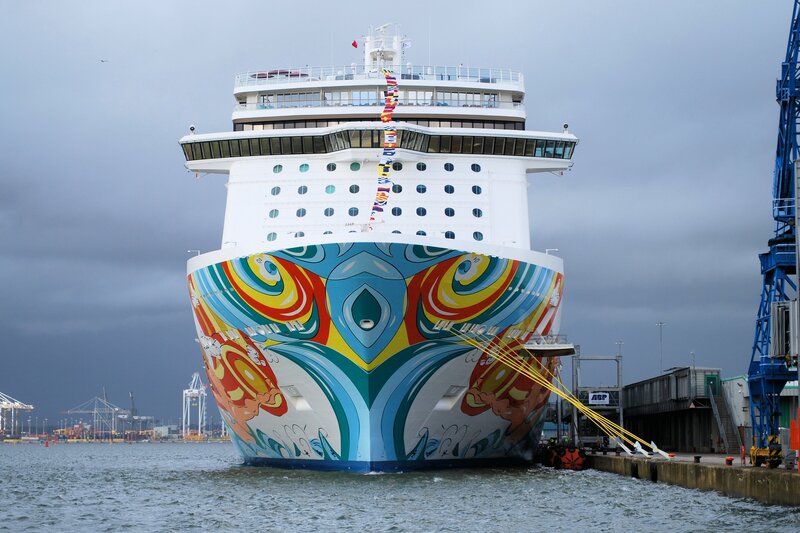 The first thing that you notice when arriving at the cruise terminal apart from Getaway’s size (big) is her colourful Hull Art, complete with surf, mermaids, and birds. It was created by popular Miami modern artist David “LEBO” Le Batard. 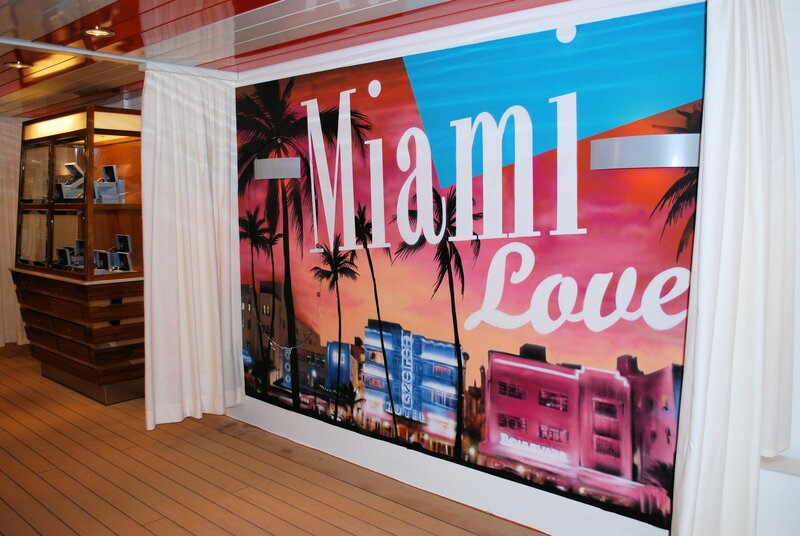 As the ship will home-port in Miami, much of the ships décor has a ‘Miami’ theme. Getaway is an almost identical design to Breakaway, although some of the public spaces have been re-named and re-themed. ‘Freestyle’ has determined her design and she is packed with dining areas and bars. These often have an open-plan design, with some of the bars, and dining areas seamlessly blending into each other, sometimes without walls. It is quite an assault on the senses. What you do not get on NCL ships is any big ‘wow’ spaces such as tall Atriums, ‘Royal Promenades’, Parks or many double height rooms. A reduced compliment of 2,900 passegers were booked onto this inugural event. Getaway has 14 passenger decks numbered from 5-18. Deck’s 6, 7 and the rear half of deck 8 accommodate most of the public spaces. The ship only has two stair towers/elevator banks, which is not ideal for such a long ship. However there are some stairs between decks 6, 7, and 8 amidships, at ‘678 Ocean Place’. This is a sort of mini-atrium with giant LED Chandelier. The elevators are large and efficient. It’s interesting how NCL’s internal décor has changed over time. A few years back their ‘Dawn’ and ‘Jewel’ class ship were rather colourful and very glitzy on the inside. However just like McDonald’s, they have now dropped the prime colours and embraced a more classy ‘Cappuccino lounge’ style. Internally Breakaway has lots of tasteful brown wood (effect) and beige décor, often creating an understated look. In fact, some public spaces on-board Breakaway could easily be on-board a Celebrity or Cunard ship. There have been comments that Getaway is a little more subtle in terms of internal colours than Breakaway. There are various interactive touch-screens around the ship, in the public areas. These can provide deck plans, information about dining and entertainment. 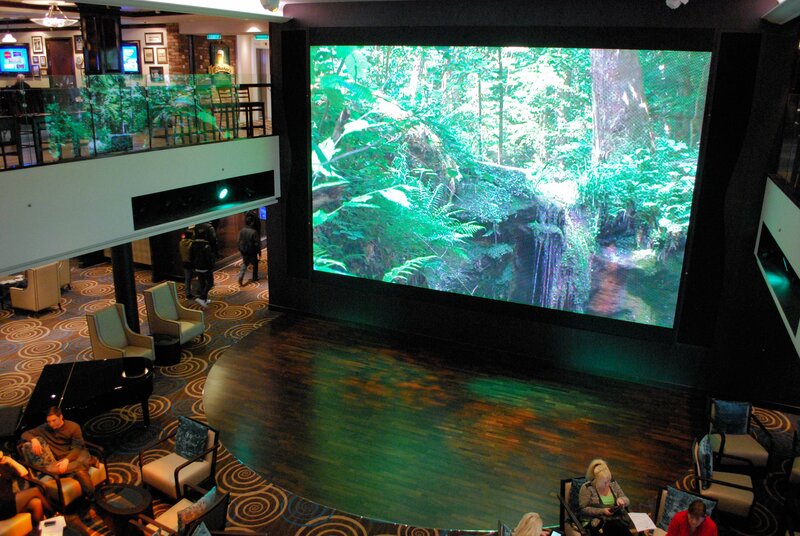 The Atrium is a modest affair (double height) compare to Royal Caribbean ships, dominated by a giant hi-definition video screen and some seating. This instantly says ‘modern’ and ‘lively’. Fortunately the screen often show relaxing scenery from around the world. This atrium the location for guest services, shore excursions, a café (a subsidiary of ‘Carlo’s Bake Shop’ on the Waterfront) and a bar. There is also a small library, card room, internet café nearby. O’Sheehan’s Bar Grill (named after NCL’s CEO Kevin Sheehan) has an Irish pub theme, and offers 24 hour food. It is located on the deck above the atrium, allowing guests to look down through the big cut-out. The food served is of the ‘fast food’ variety: fries, chicken burgers etc. There are various pub games on offer and a bowling alley. The ‘Bliss Ultra Lounge’ is not really a lounge at all, but a night-club. Bliss is quite small given the size of the ship. In terms of décor it is just a big windowless, empty black box, with lots of LED lights. There is of course a bar with some bar stools and a limited number of comfortable chairs at one end. It has trendy exposed air-conditioning pipe-work overhead. It modern and is clearly designed for standing, dancing and drinking, and certainly not relaxing. There are very few places where you can just sit and relax on this ship, without feeling that you should be spending money. The atrium seating areas is the nearest thing to a ‘lounge’ on-board, but even then waiters form the nearby café will home in on you. There is unfortunately no forward observation lounge, like the ‘Spinnaker’ as featured on most earlier NCL ship. So how many dining options does Getaway really have? NCL tend to be very creative in their counting: There’s the Tropicana, Taste and Savor – these three dining rooms, share a menu and the same kitchen, so that’s 1 option as far as I’m concerned. The Garden Café (buffet) is 2 and O’sheehans is 3. (Those were the free options). Le Bistro (French) is 4, Cagney’s (Steak) is 5, Moderno (Brazilian) is 6, Teppanyaki (Japanese) 7, Wasabi (sushi) 8, La Cucina (Italian) 9,Shanghai’s (Asia) 10, Ocean Blue/The Raw Bar (Fish) 11, dinner at the illusionarium 12, Room service (inc. 24 hour Pizza) 13. I’m not including the Atrium café, Bake Shop (Cake), Dolce Gilato (Ice Cream), the Chefs table (gourmet experience for 12 passengers), the Haven Restaurant (for Haven guests only) , the Studio Lounge (for Studio guest only). These either provide snacks or an ‘exclusive’ experience, limited to certain guests. Most of the speciality restaurants have an internal entrance (from 678 Ocean Place) with internal seating and an entrance from the Waterfront, with external seating. I don’t count that as two dining options. So I count 13 proper options. It’s irrelevant really, as there are certainly more dining choices than any other cruise line and more than you can sample on Getaway’s normal 7 night cruise itinerary. Getaway’s Manhattan room (at the stern of deck 7) has re-branded on Getaway as the ‘Tropicana’ are given a Miami-ish make-over, although still not dissimilar to Breakaway & Epic’s version. Like the others, It is arguably one of the most attractive rooms at sea. 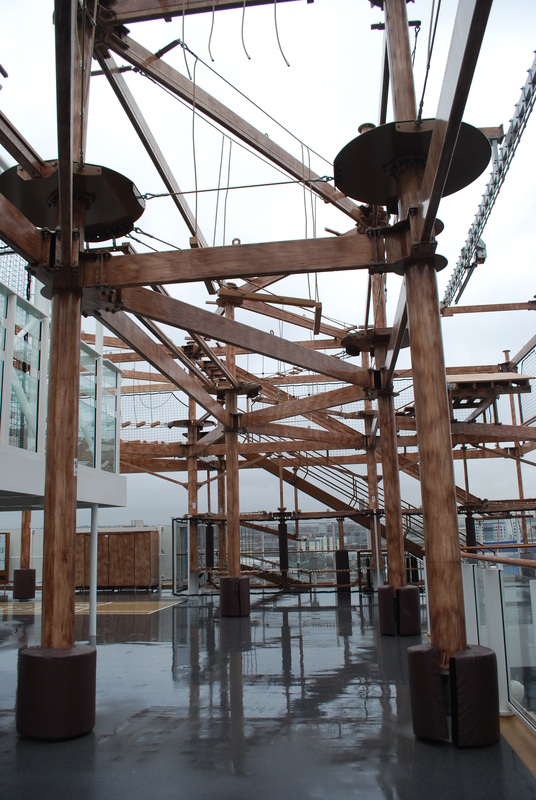 It has large floor to ceiling windows and a large wooden dance floor, with a stage for a band. The centre part is a double height room . Cagney’s and Moderno Churrascaria (surcharge dining) are located above the Tropicana and overlook the dance floor through windows. Occasionally extra tables are put on manhattans dance floor which unfortunately spoils the whole concept. Either side of the main passenger corridor (deck 6) there is the other two more main restaurants called ‘Taste’ and ‘Savor’. These are two almost identical dining areas which form two other inclusive dining options. These are both more sedate and much more intimate than the Manhattan. Taste, Savor and the Tropicana all share the same kitchen and menus. 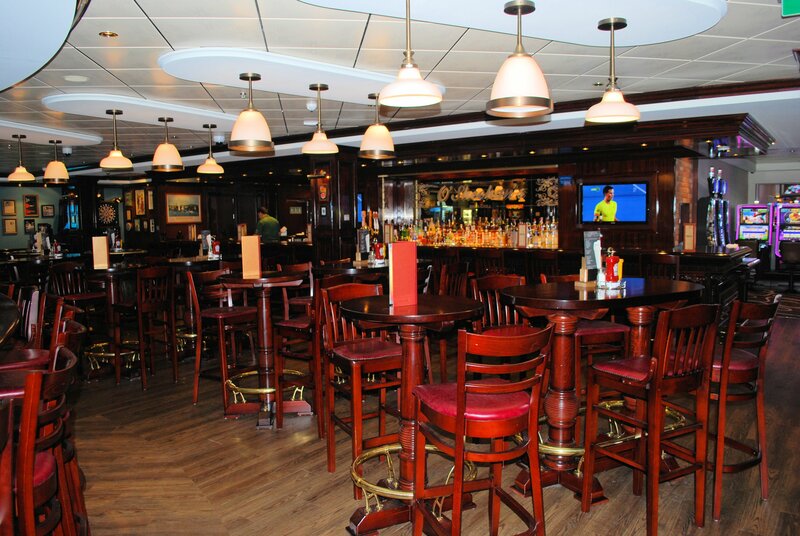 The Garden Café is the ships self-service buffet and is located at the rear of deck 15 and is spacious, light and airy. It had a very good range of food and a very large amount of seating. An interesting feature is that some sinks are located at the entrance, so you can wash your hand in the traditional manner. The Garden Café can still struggle with the crowds at peak times, yet still manages better than most. 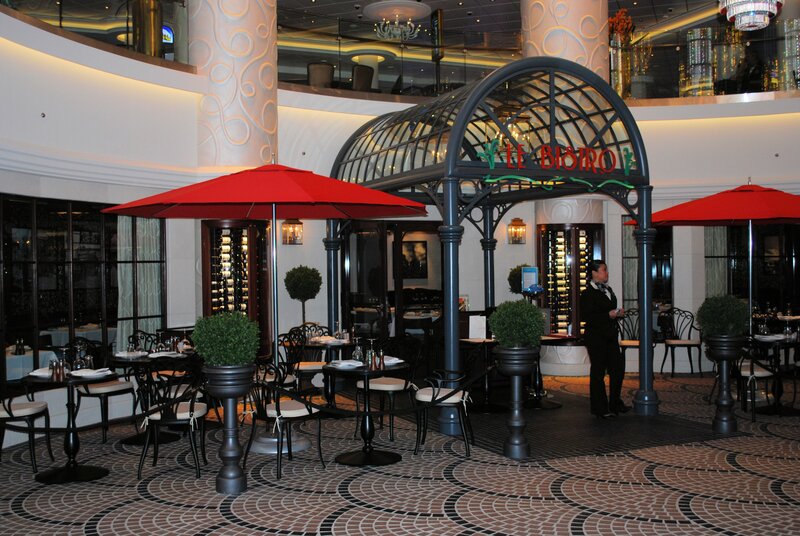 Le Bistro, the French style NCL favourite (with surcharge), is located at the bottom of the three-story ‘678 Ocean Place’ atrium. However most the surcharge dining options are located on the Waterfront. Le Bistro does not have any windows, but never the less it and looks a very attractive and is an intimate dining room. There are some tables outside, on a cobbled street French café style. I did not use it on Getaway, but on other NCL ships it has provided me with one of the best dining experiences on-board. ‘The waterfront’ (deck 8) as first feature on the Breakaway ships is a very attractive concept which re-invents the promenade deck. It’s a very simple idea, in which NCL have located most of the ‘speciality’ dining options and some bars, overlooking a wide teak promenade deck. Walking along it, reminds me of my childhood visiting seaside piers. (The lifeboats have their own promenade deck, some decks below). I believe Escapes is slightly longer than those on-board the breakaway class ships. Below is a short video of Breakaway’s ‘Waterfront’, which is very similar to Escapes. The various restaurants located on the waterfront have large windows offering sea views and lido dining on the promenade deck. 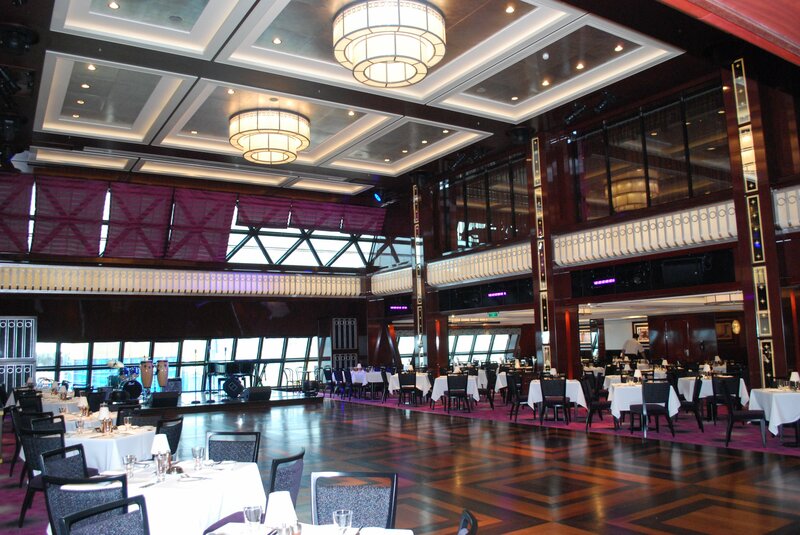 These restaurants can also be accessed from inside the ship, via the ‘678’ Ocean Place’ atrium. There are also retail outlets overlooking the prom with internal and external doors to access it. All of the dining venues on the Waterfront carry a surcharge which is a fixed fee (at the time of writing). A cynic might say that NCL have finally found a way of charging passengers extra to eat and drink in the fresh air. Never the less, it is a very appealing facility. In Southampton’s winter climate, I was not really able to see ‘the waterfront’ fully utilised. However I do have a couple of concerns about it. Firstly, the amount of external restaurant seating and standing room at the bars, is quite limited. As the ship can carry 4,000+ passengers, the waterfront it is bound to get very crowded in a warm climate. It is also worth noting that the space between the rail and chairs/tables is only two people wide at some points. Talking a walk along the waterfront when busy, may well prove to be quite difficult. Secondly, I am also concerned how much noise will filter up to the balcony cabins directly above. NCL claim that wind-tunnel tests prove that wind will not be a problem on the waterfront. However if the wind is blowing hard enough, of course it will be. If a ship is proceeding at 20 knots a certain amount of wind is created anyway. 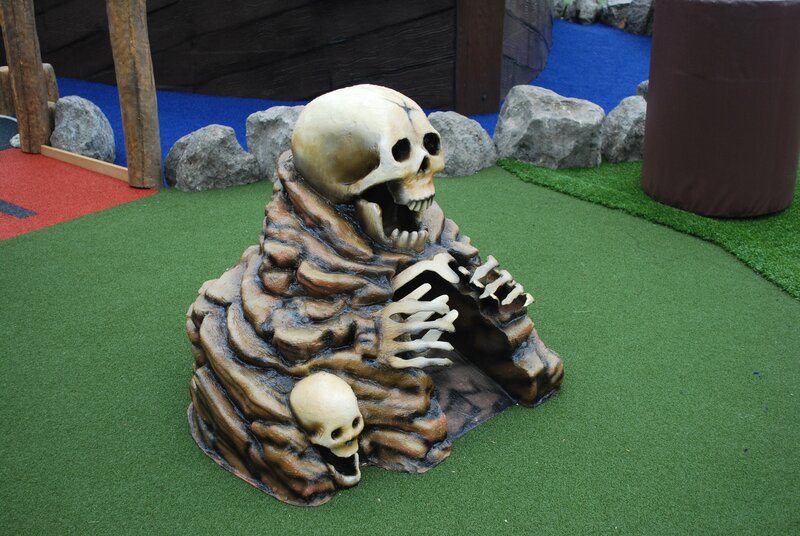 Underneath the Ropes-Course it is a miniature golf . The aqua-park and sun-deck will obviously get very busy in a warm climate and there are concerns from commentators whether it is a big enough space. In contrast, the Haven complex has it own pool and piece of private deck for sunbathing. Spice H2O: Is an outdoor public area, with a large video screen, bar, dance floor and performance space at the very stern of the ship (but no pool). This will prove very popular in warm climates, for sun-bathing during the day and an open-air night club or music venue during the night. Once again I expect it will get rather crowded at times. 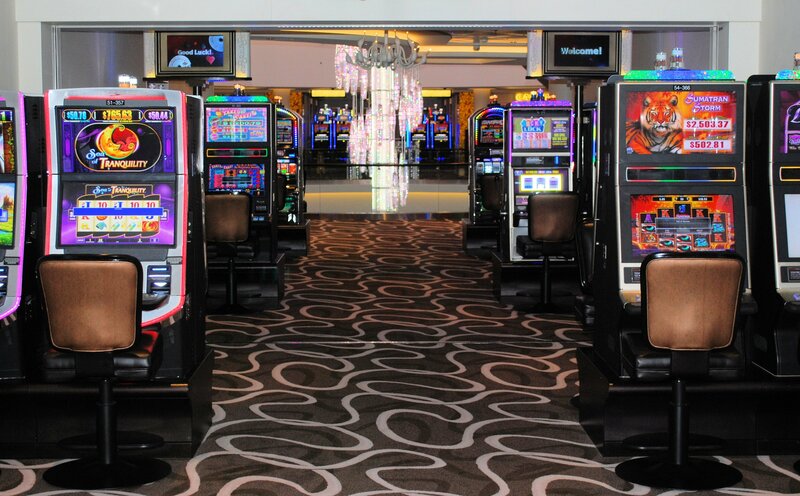 The Casino is one of the biggest at sea with an open plan design. You will often find yourself passing through this area to navigate from aft to forward or vice versa. The Getaway Theatre has 900 raked seats, but no balcony. It is not as big as you might expect for such a large ship (traditionally theatres on-board ships could often accommodate half the passengers at one performance). However there are of course alternative entertainment venues: Headliners, The supper Club (more about that later). Ideally you need to book your entertainment in advance, to ensure that you are not disappointed. Having to book is course is not very ‘Freestyle’, is it? 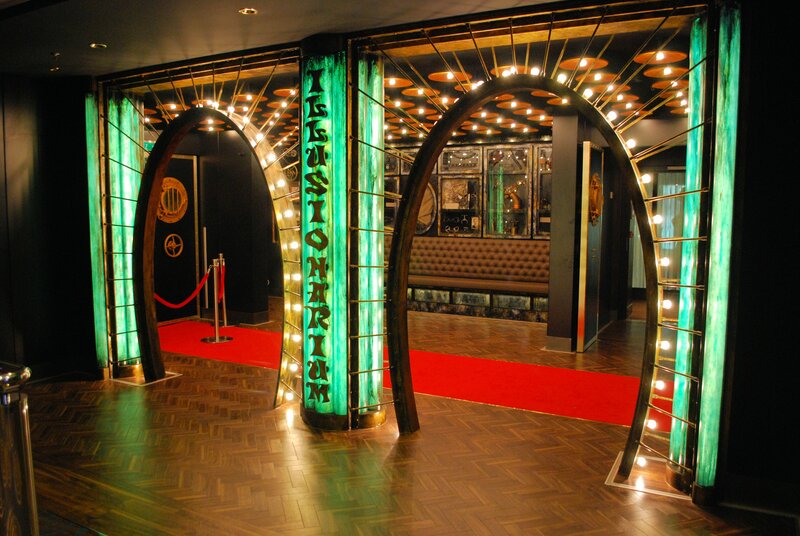 Breakaway’s original Spiegel Tent, was a room which resembled a big-top circus tent has been replaced on Getaway with ‘The Illusionarium, a relatively intimate cabaret venue. For a surcharge you get a set meal and the show. There are ‘premium’ seats near the stage and ‘standard’ ones, which are not so close. There are two price bands respectively, however the view form some standard seats is not always very good. The meal in this venue (a fixed dish of Surf & Turf) was mediocre, However the magic show was very good so i did not really focus on what I was eating. ‘Headliners’ still features the duelling-pianos show ‘Howl at the Moon’ which always generates a great atmosphere. The Ice Bar is just like Breakaways and is quite a small minimalist room. However I always thought that it was good fun for half an hour. Getaway has some 25 different grades of staterooms ranging from Suites (including the luxurious owners suite, family villa, and courtyard penthouse all in ‘The Haven’ complex) to Ocean-view, Balcony (including Spa-Balcony rooms) and Inside (including the 59 single occupancy Studio Rooms). Similar to the design of Epic and Celebrity Solstice class ships, the lifeboats do not dramatically obscure the sea views of any of the cabins. The corridors are quite understated in décor. 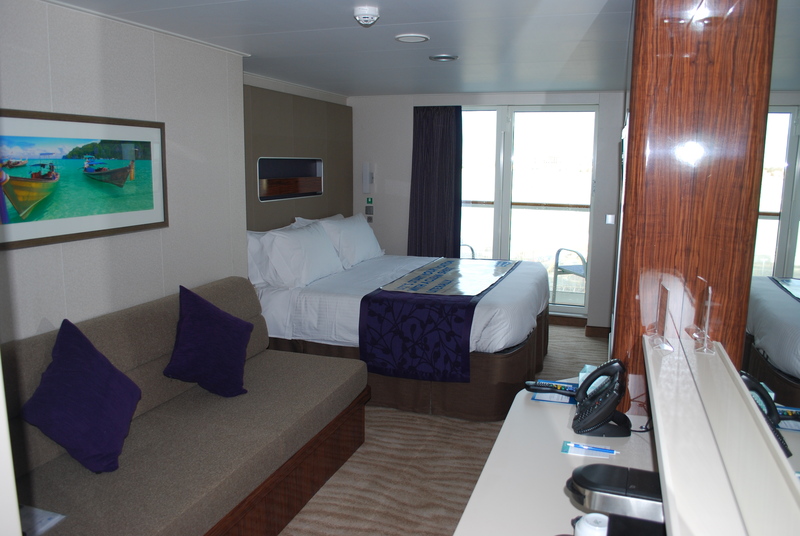 My accommodation was in 13180 (deck 13) in a mid-ships mini-suite, of 207 sq ft. This cabin and many other grades are long and narrow. Alternatively these cabins are configured with the bed by the balcony doors, others have the sofa next to the doors. The balcony was small (32 sq ft, 8ft x 4ft). In fact it was just big enough for two upright chairs and a tiny table. If you were tall your knees might even touch the glass railing. Having such a small balcony is quite odd, considering how long this grade of cabin is. A few extra feet could have easily taken from my cabin footage and added to the balcony. The majority of Getaway’s balcony cabins are only 27-35 sq ft. Even the top grades of stateroom generally have moderate sized balconies, when compared to other ships serving the mass-market. This seems to be is a major design error by NCL. On a positive note, my cabin was very attractive, functional with relaxing décor. There were US and European power sockets, but no UK variety. The bathroom was one of the biggest I’ve ever had and much bigger than those in the lower grades of cabin. The sink was a double-sized ‘trough’ with two mixer-taps at each end; ideal for couples who want to simultaneously clean their teeth. The shower was a large glass cubicle with big shower head and additional body-jets. There were shampoo and shower gel dispenser inside the shower cubicle, just to remind you that this was a mass-market ship. The cabin had a coffee maker, always popular with Brits, which is very rare on American ships destined to operate in US waters. The wardrobe had sliding doors which I always find annoying. I though the wardrobe space was quite minimal, especially for a woman like my wife who enjoys dressing up. However it was probably adequate for Caribbean attire on a Freestyle ship. The safe was in the wardrobe. I was impressed that it had an internal light when you opened the door, but it automatically went out too quickly. However the safe was a little small if you like to put things like cameras in it. The cabin door had little red and green indicator lights above it, in the corridor. 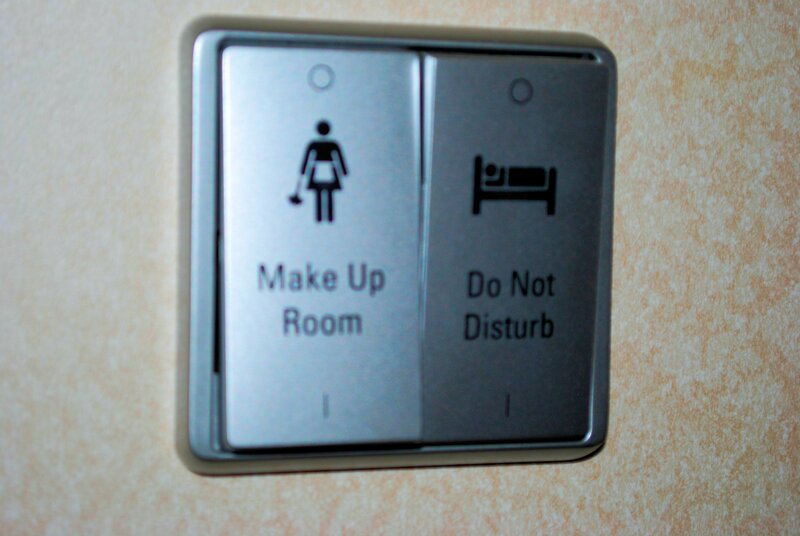 Two switches inside the cabin allowed you to request “make up my room” or “do not disturb”. Gone are the cardboard door hangers. For the record: lifeboat-drill is done without Life Jacket being required to be taken or worn. It is now though that passengers tripping over trailing life-jacket straps as they proceed to a drill, or return, is a significant risk. Getaway is an amazing floating ‘resort’ and is going to be a massive hit. She makes ‘regular’ ships look boring. NCL are now providing direct competition for Royal Caribbean’s newer ships. It’s not just media hype, Getaway’s design really does take NCL’s ‘freestyle’ concept to the next level. Getaway is built for ‘fun’. She will suit those wanting a casual, but ‘busy’ cruise experience, packed with multiple dining and multiple entertainment options. Families are well catered for. She will not suit those looking for tradition, relaxation and tranquillity. No other mass-market lines matches Getaway’s dining flexibility and choice, although NCL food and service can be inconsistent at times. It is worth remembering when you are comparing fares of the rival cruise lines, that NCL are market-leaders in the additional on-board surcharge. Although the many surcharges are optional, they are also very tempting. However you are paying for the increased ‘choice’. It is important to note that these big ships are designed on the premise that not everybody on-board will want to do the same thing, in the same place, at the same time. This premise largely works, but when it doesn’t, expect queues and congestion. Breakaway is definitely a ‘busy’ ship. I do wonder how the ‘Aqua-Park’, ‘The Waterfront’ and ‘Spice H2O’ will cope with the crowds on a sunny day or on a warm evening. Although a very simple idea, Getaway’s ‘Waterfront’ makes her much less ‘inward’ focused when compared to many other mega-ships. After all cruising should be about connecting with the sea, at least occasionally. Hi, sorry but I’ve never cruised with Carnival, so I cannot assist. All of these modem big ships have big casinos.